The following is a list of major casinos that will open or have major modification in upcoming months/years in the Las Vegas area. As these new casino construction/modifications near completion we will provide more information in our newsletter. Sign up here to receive your Newsletter. 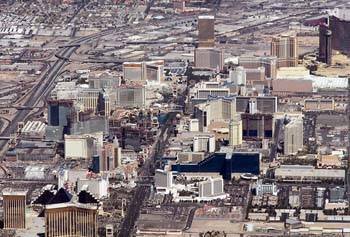 Las Vegas is a city that often has many new projects proposed, but unfortunately not all are built. Good luck to all those developers. Caesars Palace Casino’s newest tower, Octavius, with 650+ rooms is the sixth tower of the casino has hit a serious snag in completion. The mid summer 2009 opening will occur for the convention area and pool area, however the tower with the 650-rooms will not open until there is a demand for additional casino rooms within Las Vegas. The $1 billion dollar expansion is just another casualty of bad worldwide economics. No date release for complete tower opening. Located between Monte Carlo and the Bellagio on the Las Vegas Strip. This is the largest (most expensive) private construction project in the history of the world! A proposed $9 billion and about six years will develop this modern marvel. Numerous condos, time share units, one casino and dozens of restaurants will be created. Estimated fully completion date is 2011, however some of the project will open late 2009. This mammoth project is owned by MGM Grand Casino. The old Stardust has been closed and the Westward Ho and is in the process of making way for a $4.4 billion complete rebuilding of this prime real estate location into a new casino resort called, Echelon Place. Completion was scheduled on late 2010, HOWEVER, the project has now been put on hold for a minimum of a year and possible longer. The Fountainbleau Casino is scheduled to be a $2.9 billion project which features 3,812 rooms inside a 725-foot, 63-story complex. Expected to open in late 2009, however the project is now on hold, looking for more financing or a new owner. The Fountainbleau is located just south of the Sahara Casino and north of the Riviera Casino, on the same side of the famous Las Vegas Strip. This is the property the old El Rancho Casino and the Algiers casinos were originally occupied. Yes, this may be a name conflict with the existing Plaza Casino in downtown Las Vegas. The famous New York Plaza is trying to build their Las Vegas version. Sitting on the old Frontier Casino 34.5 acre property, the new casino was originally scheduled to open in 2011. Might be a light difficult since they have not turned one shovel of dirt yet? Looks like another Vegas project that looks good on paper but never gets built. In November 2008 the Las Vegas Sands Corp., parent company of the Venetian Casino announced they stopped construction on their $600 million dollar condominium tower. No date has been issued from completion.